1913 - 20 AUSTRIA selection of 16 pcs of advertising labels and national revenues, Sokol festival 1912, Tyrš, exhibition Czech stamp collectors in Prague 1914, včelařský congress 1914 etc..
1915 AUSTRIA 20 pcs Surtax varnished labels German club/association with coats of arms towns - Oderfurt, Hohenstadt, town Liebau, Mähr. Astadt. 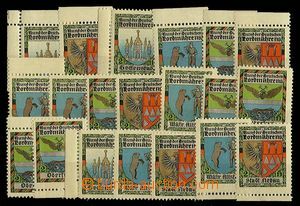 1942 Germany, block of four various labels after/around 5Rpf Kriegsbilder (propaganda), perforated and at top cut, interesting. 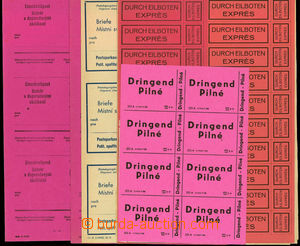 1968 - 74 CZECHOSLOVAKIA 1945-92 selection of exhibition nálepek: PRAGA 78, Brno 74, Budapest 71 (middle sheets various colors), Přepravit helicopter (whole printing sheet), Balonová post. All on card/sheet A4. 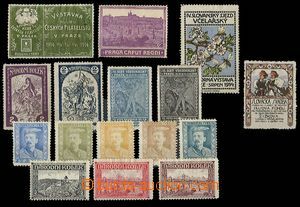 1915 - 48 selection of 16 pcs entires with mounted various advertising and Surtax labels, Austria, CZECHOSLOVAKIA 1918-39, CZECHOSLOVAKIA 1945-92, much interesting. 1856 Festgebete der Israeliten, M. E. Stern, Wien 1856, bound book in German and Hebrew. 1902 illustrated Jewish calendar, issue Prague 1902 in German and Hebrew, good condition. 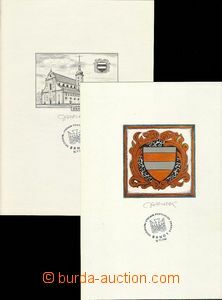 1906 annual message co-operation of Czech national theatre in Brno + 4 interesting paper/-s.
1968 Photoalbum Central branch football Czechoslovakia - V reminder on/for state representative 1968, total 14 photos with description single zápasů.